"The book on stoicism that's taking the NFL by storm." "Follow these precepts and you will revolutionize your life. Read this book!" "A book for the bedside of every future--and current--leader in the world." "First came Marcus Aurelius, then Frederick the Great . . . and now there's you. 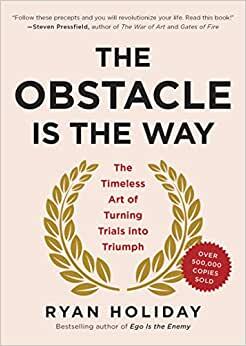 This surprising book shows you how to craft a life of wonder by embracing obstacles and challenges." "A very, very good book with lots of examples about people who had to overcome great obstacles to have success." "In this tight, engaging book, Ryan Holiday shines a bright, powerful light on the path to living and leading well. Read it, learn from it, and get cracking!" "My life has been beset with obstacles. It takes practice (and pain) to surmount them and achieve success. Ryan's book is a how-to guide for just that." "Ryan Holiday has written a brilliant and engaging book, well beyond his years. . . . It is invaluable." "Even though I was familiar with the basis for this book -- the ancient philosophy of stoicism: overcoming obstacles through the practice of wisdom, courage, self-control, and mindfulness -- it felt like a revelation when I read it." "Tremendous! Go buy every book that Ryan Holiday has written." I looooove this book. The ideas aren't entirely new. It's more like the author has taken the most important aspects of wisdom and compiled it into effective examples and phrases that really hit home. I've underlined every page. It's really helped me be less reactive, more intentional, more disciplined, and even keel. I wish the book was longer and that there were more authors writing about this philosophy. The premise is simple: focus your energy on the the things that are in your power to change, and don't waste your energy on emotional turbulence or hyper-analyzing everything. The reason this philosophy has the power to inspire so many more books is that it can apply to every aspect of our life: how and whether we muster the courage to make a change, how we drive our cars, how we schedule our days, what we choose to eat, how and whether we resolve conflicts. One of the most helpful applications of this book is changing the ways I interact with my family of origin. My parents and siblings are anxious, doubtful, and pessimistic. For the most part, I am not. However, for years I've struggled with my own reactions to being around them. Every family holiday or vacation caused me to regress to adolescence, and after each event, it took weeks for me to recover. Through this book, I realized that my reacting to their reactivity was totally ironic. I don't have to react to them. Once I became aware of this, it became a choice. Now, I can choose to see these family events as opportunities to feel grateful for my own equanimity. And when I do lose balance, I can be easy on myself, because I remember that new habits take a while to develop. I can also choose to remove myself from environments that aren't serving me. Very empowering, very practical. Thank you, Ryan Holiday! This is overall a really good book and it was a great introduction to Stoic philosophy for me. However, the tone is very focused on promoting modern busy culture instead of stepping back from it. More like a book to help you use Stoic techniques to do better at what you are already doing instead of figuring out what is really important. It seems very focused on doing big things in life and most of the examples given are the same old tired people we've heard about a million times, mostly rich people, military generals and CEO's. I guess for pop culture, those examples are fitting. I would have preferred something more introspective in tone, but that's just me. 525 people found this helpful. Outstanding. I used to have a practice. Each year, at the end of the year, I would take about 20 minutes to write a list of all of the "bad" things that happened that year. Then, I would take the list outside, burn it and bury the ashes. Kind of a release from the burdens or pain that came from the tough times. They were over. I could move on. Now, I make the same list, but instead of burning it, I go back over the list and beside each "bad" thing, I write a positive development that came from it. I think about what I learned or how I worked through the challenge. This empowers me to actually appreciate and show gratitude for the tough things that happen. Positive change of mindset from reading this book. Thanks. The most actionable advice from a self-help book that I've seen. I don't know the motivations of the author, but it doesn't matter. So much usable material packed into one place...my version is highlighted and marked up and I open it up to a random page whenever I need some inspiration. So many years, so much pop-psychobabble, yet the ancients had the most pragmatic approach all along. Makes sense, when you stop to think of how much harder and less predictable life was. One huge lesson Ryan has taught me is to not be too quick to prejudge the value of a book about life based on the author's age, an inherent bias I suppose a a lot of people my age has. I am 62 years old and believe that wisdom only comes with experience and education, and experience is a function of quality and quantity. It is rare to find someone in their early 30s with such insight into life. This book is excellent and has ignited in me the desire to learn more about Stoicism. I enthusiastically recommend this book.